Regardless of whether you are a self-confessed caffeine addict or not, a coffee table is a must-have piece of living room furniture, giving the room focus and creating a social space from a seating area that would otherwise look unanchored. So, it's important to get the best coffee table for your room, whatever, its style. The good news? We think we've cracked it with this selection of the best coffee tables on the market. Whether you have a traditional living room or go for a more modern look living space, we've got you covered. 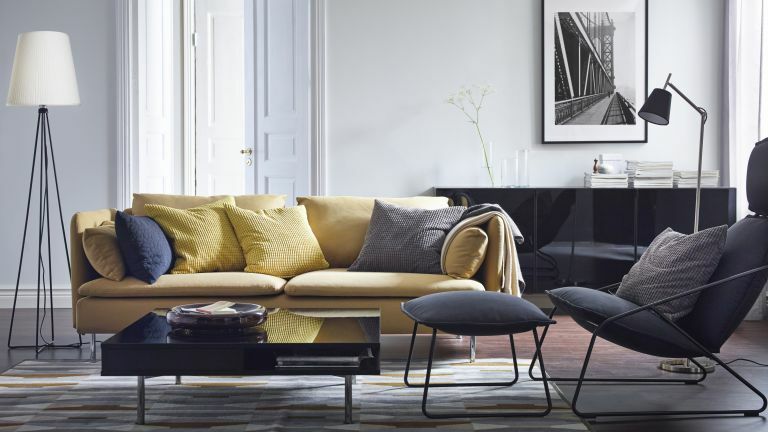 Use our guide to choose the best living room furniture for your home, in terms of style, size and quality. This coffee table from West Elm is certainly a striking design that could be just the thing to add a little character to your space. The glass top sits on a cluster of steel rods which have each been hand crafted and give the illusion of a floating coffee table. The brass finish is very modern and although busy, lends itself to minimalist décor nicely. If you’re looking for something decorative to complete a room, then this is a popular design choice. Love the Mid-century modern living room look? This retro style coffee table, with its soft, curved edges pays homage to simple 1960s' furniture. The wooden effect table is a popular choice for its versatility and handy storage shelf where you can place books and magazines. It is quite a long table, so smaller rooms may be overwhelmed by this coffee table, but for an empty space that needs filling, customers felt the Hooper table added a touch of warmth and practicality to their living area. This tray-style table is made from mango wood which many people are turning to as a modern alternative to pine. The colours are lighter, and very popular in neutral or shabby-chic style schemes due to its rustic appeal. Its round shape also makes it a little more accommodating for smaller rooms, but may get lost in larger spaces. Those who have this coffee table find it to be sturdy and stylish and just right for storing things on the bottom and placing drinks on the top. If you don’t have a dining table in your home, then you may find the Flippa Functional Coffee table by Made to be a useful addition to your living space. Whether you’re having dinner in front of the TV or working from home, this large coffee table has extending parts which allow you to use this table in a range of different ways. It also has plenty of drawers, ideal if you need some extra living room storage. This coffee table podium in grey is very minimalist but has hidden storage which will help keep the room looking neat and tidy. Simply slide the top across to reveal the extra storage space, but customers have warned that the edges are quite sharp so if you have children about the house it may not be suitable. The top is easy to wipe clean and although it does require some assembly, customers have said this is really quick and easy to do. If you don’t want something too big or busy that will overwhelm the room, then you may find that this Calia Coffee Table provides just what you need. It’s solid and sturdy, with a distressed finish on the top that customers say complements most room schemes. With no storage, it does leave space underneath the table, making it an ideal place for children to sit and colour or play with toys. Those who have this coffee table recommend always using coasters as the heat from mugs can easily leave permanent rings on this wood. If you are working with a small living room, this tempered glass coffee table from Wayfair is a practical choice that doesn’t make the space look cramped. Customers found this table to give their living area the illusion of more space due to its transparency, and found the clean, straight edges to add a modern touch to their home. Strong, beautiful and built to last – what’s not to love about metal garden furniture?